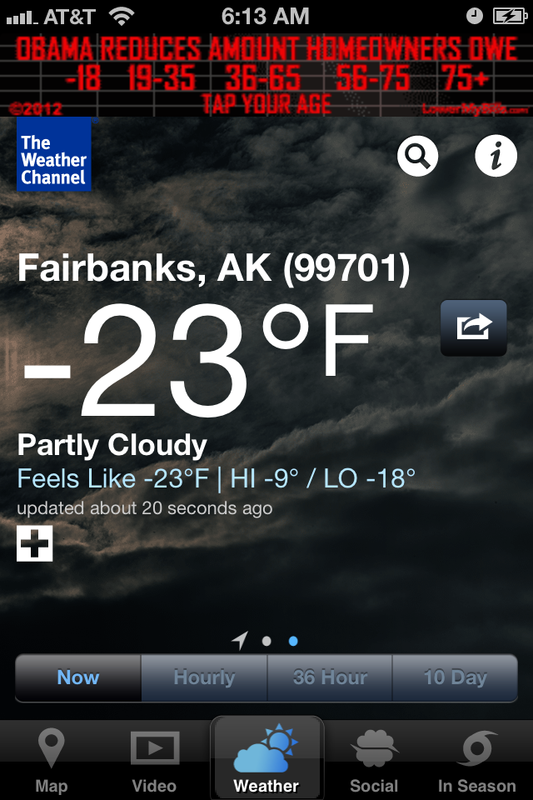 As the temperature drops my pain increases. I pop more pills, turn up some music, and keep busy to keep my mind off it. Today is one of those days. I’ve been going through a lot of yarn and pills. I went on Ravelry.com and looked for some things on my list to work on. 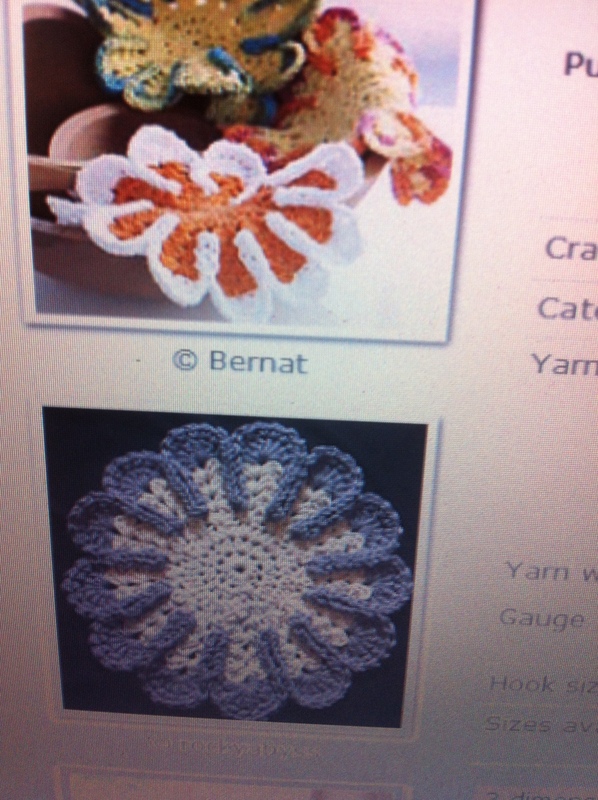 I even downloaded a nifty iphone app called Yarma that connects to ravelry. It is a simple app that is solely for taking and uploading pictures. There are a handful of effects with clever fiber-friendly terms like K2tog, top down, lace weight, granny square (which adds a simple frame)… and vanilla for none. All are simple so they wont over-power the beauty of the handmade item. The first thing I made was a simple dishcloth which I’m pretty sure is based on a vintage potholder pattern I’ve seen before. I had to be different though so I improvised a bit. 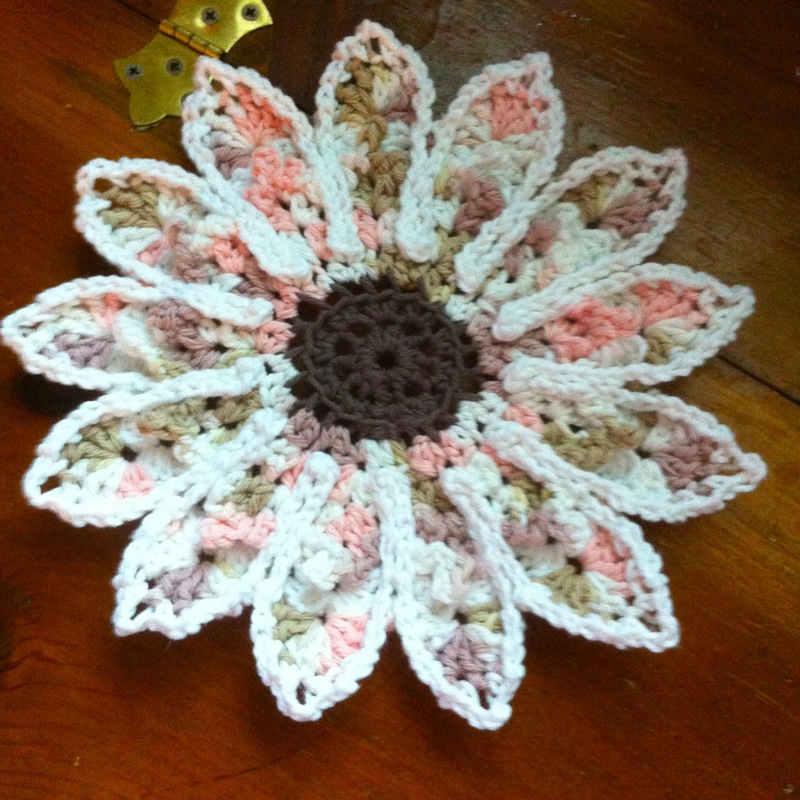 The pattern has a bunch of rounded petals but I wanted mine to be pointed like a daisy. With a little patience I finally got it to come out like I wanted. I like it a lot better than the original pattern but I will probably make some without my adjustments too. They are very cute and cheerful. 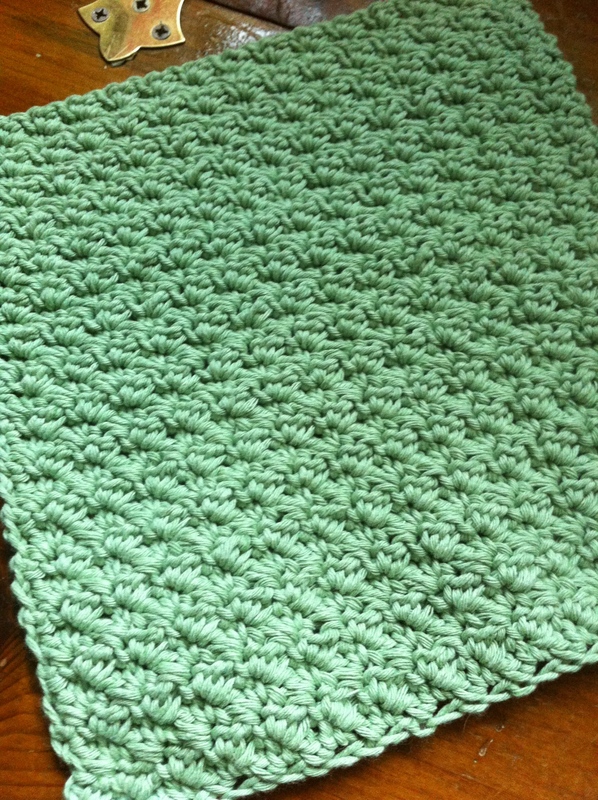 I made a more simple washcloth yesterday and loved how it turned out. I used this super soft, “Moss” green yarn that I bought one time without a clue what I would use it for. I just new I needed to make something with it because it made me so happy! So this one is mine and I’ve already used it. I talked to my big sister today. She is always a good person for me to talk to when I don’t feel well. I was trying hard to stay awake so I could get my sleep schedule straightened out. Well she reminded me of this pineapple scarf pattern that she loves and so I started making one. I have this ball of Bouclé yarn that I’ve been hanging onto, waiting for the right project for this kind of yarn. It has a texture that makes it difficult to work with but it always comes out beautiful! It kept getting tangled up on itself and if it gets too tangled you might as well just cut it off and start all over. 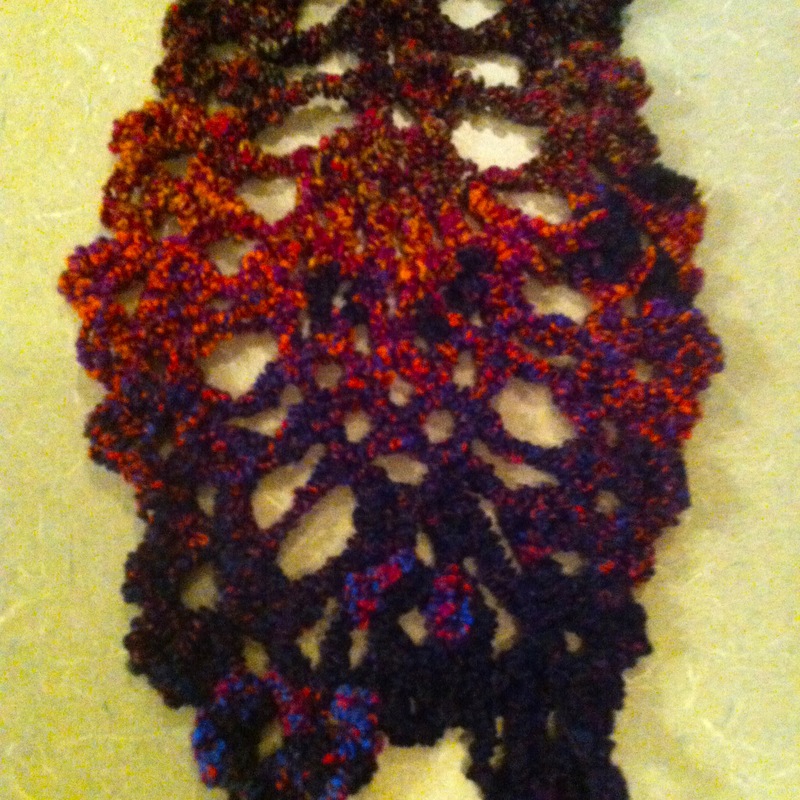 Well I have half of the pineapple scarf done and it looks fantastic! I just love the jewel tones mixed with black. I am making it longer than the pattern says and I think I’ll add a tassel or fringe to the ends.